History for Sale: The Agnews hospital building is slated for demolition to make way for a massive R&D campus. 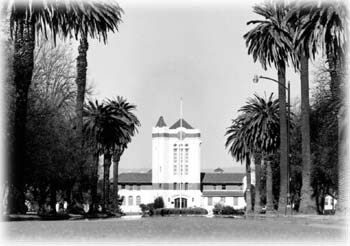 THE BEST WAY to view the Agnews Developmental Center is to enter the grounds via the palm­lined road off Santa Clara's Lafayette Street and proceed toward the stately clock tower. The approach affords a view of the center's Spanish-style buildings, largely unchanged for more than 80 years. It's a view that is likely to change dramatically in coming months. On a recent Saturday afternoon, Liz Holmes and Jacob van Heeckeren walked down the aptly named Palm Road admiring the historic sites. Stopping at the foot of the clock tower, Van Heeckeren pointed out that most of the buildings date back to soon after the great quake of 1906. The quake leveled an older hospital built in the 1880s, he says, and that necessitated construction of the "new" facility for the care of the disabled, which was considered progressive for its time. On a tour of the nearly 90-acre property, we stopped to admire the grand ballroom, as well as a series of residences and support facilities which once allowed Agnews to function like a miniature self-sustaining town. But the pair didn't arrange the visit just to show off the center's past. They have a vision for its future. Holmes and Van Heeckeren are fighting the California Department of General Services--the current owner of the land--in the hope that Agnews someday will become a historic district for public use. If the state has its way, it will sell Agnews to the Mountain View­based Sun Microsystems Inc., and Sun will develop the land for a massive research and development campus. Holmes and Van Heeckeren say the proposed sale is a poor use of public resources. And they suggest that it was accelerated because it was a done deal from the start. SOMETIMES ACTIVISM comes from unlikely sources. Holmes and Van Heeckeren are the first to admit that their initial interest in Agnews was as unlikely as it gets. Van Heeckeren, 58, leads a big band, and Holmes, 34, is the band's singer. They went in search of the Agnews Ballroom in 1995 because they were on the lookout for venues where they could practice and perform. It wasn't until August 1996 that the pair learned the state intended to sell Agnews. Their interest in the place immediately became more than musical. "When we heard that the ballroom was going to be sold and possibly destroyed, we went to a City Council meeting just to see what was going to happen," Holmes says. "At the meeting, we couldn't believe what we were hearing. That's when we got involved." They began by filing an application with the state's Historical Preservation Office to register Agnews as a national historic district and to try to preserve the buildings for public use. Their application pointed out that the state had already found a prospective buyer for the property, and mentioned that Sun intended to destroy most of the buildings. "In other words, Historical Agnews will be gutted," Van Heeckeren's cover letter concluded. More recently, Holmes and Van Heeckeren tried to derail the state's efforts to rezone the land. In early April, the two preservationists sought and gained a recommendation from Santa Clara's Historic Landmarks Commission that the state approve the historic designation. They also resubmitted a substantially beefed-up 200-page application to the state office. Even though the state owns Agnews, the city of Santa Clara must approve the zoning changes needed for the development to proceed. Holmes and Van Heeckeren believe the city would be less likely to grant such a zoning change if the land were deemed historically significant. "It's more a thorn-in-the-side kind of protection than a cast-in-stone kind of protection," Van Heeckeren says, while admitting that the city could rezone Agnews regardless of its historic status. "But somebody would have to sign on a piece of paper that they approved the bulldozing of a historic district. And an elected official is not likely to be very anxious to have that on his résumé." Officials at the state Historical Preservation Office confirm that they have examined the application, and they say it probably will be approved for National Historic Register consideration by the end of May. The City Council's vote on whether to rezone the land is tentatively scheduled for Sept. 9. AT THE HEART of the dispute over Agnews are conflicting perspectives. "What we are proposing for the Agnews site is a one-million-square-foot development," William Agnello, Sun's vice president of real estate and the workplace, told a Dec. 10 meeting of the Santa Clara City Council. At that point the state had already entered into exclusive negotiations with Sun. Agnello went on to describe in general terms what Sun's plans would look like. He promised that some of the features of Agnews' historic core--including the auditorium, the governor's mansion, Palm Road and the facade of the clock tower--would remain virtually unchanged. He also promised that the proposed development would not be used for any form of manufacturing, and that none of the new buildings would exceed the height of existing structures. Public access to the grounds would be maintained and the majority of the mature trees would be saved. But in the same introductory comments, Agnello also acknowledged that Sun was not likely to preserve structures beyond the ones he listed. "We expect to keep many of the historical structures that we believe are at the core visual center of the campus," he said, "but obviously there are many buildings that we will propose not to keep." In April, Agnello confirmed that Sun's current plans are essentially the same as they were in December. He also explained why the company proposed to save only four of the 51 buildings: "The other buildings are simply inefficient or not cost-effective to use for office or R and D space," he said, adding that he didn't think there was any economically viable way to use those buildings. IF THERE IS little agreement on what the future of Agnews should be, there is even less on how the decision should be made. Holmes, Van Heeckeren and other concerned community members--including former Santa Clara Mayor Eddie Souza--allege that the process by which the land was put up for bid resulted in a sweetheart deal between the state and Sun. Sun flatly denies the accusations. No one from the Department of General Services was available for comment at press time. The process got under way in June of 1993, when the state's Department of Developmental Services moved all of the patients housed in Agnews' west campus to its east campus. The move paved the way for the eventual sale of the west campus, and was vigorously opposed by groups representing Agnews patients. In April of 1996, representatives from a consortium of community colleges made the first official offer for the property: one dollar. They offered the nominal sum because they believed their status as a public entity would allow the state to transfer the property to them for little or no money. The state turned the offer down cold. In July of 1996, the Assembly passed SB 1770, which designated Agnews' west campus as surplus property and put it on the block for sale. A public offering was made a couple of months later and the state entered into exclusive negotiations with Sun in November. "The whole thing was a done deal right from the beginning," Van Heeckeren says. Holmes and Souza concur. The preservationists claim the state used faulty criteria to decide what to do with the land. They say the state should have considered the college consortium's offer. State officials say they could not do so legally, pointing to a law which, they believe, required them to get some serious money for the property. "It's the law," says Anne Richards, a spokesperson for the Department of General Services. "The statute says [Agnews] must be sold at fair market value." Not so, counter Holmes and Van Heeckeren. They assert that the law is written in a way that leaves the General Services director with the option to offer the land for whatever he wants. They quote a phrase from the statute stating that the director may sell Agnews for fair market "or upon terms and conditions as [he] determines are in the best interest of the state." Souza bases his suspicion on what he believes to be the secrecy of the decision to surplus the land, and the speed with which the legislation was pushed through the Assembly. The former mayor complains that there were no public hearings at the state level and suggests that the sale was kept quiet on purpose. "It passed through the state Legislature and was signed by the governor before any of us even knew about it," Souza says. "I mean, this is a process that was unheard of." The details of the negotiations between the state and Sun are, in fact, next to impossible to unlock. When asked for the dollar figure of Sun's offer or for a list of the bidders, representatives from General Services decline to provide such details, citing ongoing negotiations. Sun is similarly tight-lipped but promises that at some point after the sale all of the relevant documents will be made public. Souza, for one, is disheartened by the state's and Sun's reticence. "Do you know the saying 'Show me the money'?" he asks rhetorically. "Well, that's what I'm saying: 'Show me the money!' "
The 90-acre spread, at current market value, has to be worth at least $50 million--maybe much more. The city of Santa Clara estimates that Sun's investment into the project, including the land, demolition, new construction and equipment, would total $230 million. Santa Clara stands to make $4.5 million in permit fees, and the state would earn upward of a million and a half from sales tax alone. AFTER WALKING AROUND the campus for about an hour, Holmes and Van Heeckeren have come back to the point where they started their tour. As they get ready to leave, they seem optimistic that the flurry of activity surrounding their efforts bodes well for their cause. But even if the city decides to deny the state's zoning request in September, it would be far from an unambiguous vote for the preservationists' vision of the property as a historic district. Holmes doesn't let such thoughts weigh her down as she drives along Palm Road. "The tide is starting to turn big-time," she says as she guides her car out the front entrance. "What seemed like a done deal now seems to be turning our way."